Over the past year, you may have read in these pages about your local electric cooperative’s concerns about government regulations and how those regulations might affect electricity generation at new power plants that might need to be built to keep our homes cool and power our modern economy. Many of you have expressed your agreement or disagreement with my words — sometimes in colorful language — and I am appreciative of the feedback you have provided me. Regardless of where we all may fall on the political spectrum, I think we can agree that our modern society demands a constant supply of reliable and affordable electric energy. Our world simply wouldn’t be the same without it. And the fine folks at your local co-op, for whom I work, are where “the rubber meets the road” on these important issues. It is serious and complex work. In what is probably the most significant regulation ever proposed by an agency of the United States government, the U.S. Environmental Protection Agency (EPA) recently released a proposed rule that would limit the emissions of carbon dioxide from existing, rather than new, power plants all across America. These rules are far-reaching and unique. And since you own your co-op, you will be impacted in some way. The Obama administration had previously proposed a national goal of reducing carbon emissions by 30 percent below 2005 levels by 2030. Instead of an across-the-board reduction, however, the proposed rule sets state-specific goals and creates guidelines to be used in making proposed methods to meet those goals. After approval of the rule, state governments will be required to develop detailed implementation plans that will determine what specific actions are taken to achieve the required reductions in carbon emissions. EPA will have the ability to approve or disapprove those plans. There are significant differences in the requirements placed upon the states. Washington state, for instance, will be required to reduce its carbon emission rate by 76 percent while North Dakota will only be required to reduce its rate by 11 percent. Tennessee’s required reduction will be 39 percent, ranking 13th on the list of most impacted states. The accompanying chart shows the three most- and least-affected states as well as the required reductions for Tennessee and our neighboring states. It is unclear how states will be able to develop plans when a particular power plant serves customers in several states or is owned by the federal government instead of private company, as is the case for every power plant here in Tennessee. Because of the nature of the rule, the nuts and bolts of what must be done to achieve the goals set by EPA won’t be clear for some time — possibly as far out as 2016. 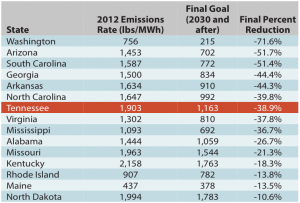 EPA set the state-by-state goals by developing a “best system of emission reductions,” and there are thousands of pages of technical details that accompany the rule and detail how these goals were set. At the time this article was authored, those details are still being evaluated, page by page. States will have several years to submit their plans to EPA for approval, and that is the point in time when the tough decisions will have to be made. We do know, however, that this rule will force a significant number of coal-fired power plants to shut down or convert to using natural gas as fuel. We know that the rule encourages states or groups of states to implement a cap-and-trade model of carbon emission allocations. We know that in order to comply, actions will be required that are “outside the fence” of a power plant — actions like requiring utilities to implement energy-efficiency or demand-management programs. We also know that new nuclear generation will help states achieve their goals, as nuclear power does not emit any carbon into the atmosphere. While it will be many years before the full scope of this plan could be implemented, there is short window of time in which the EPA will be actively soliciting comments from the public about the proposed rule. Starting with the day the rule is published in the Federal Register, there will be a 120-day comment period. As you become more educated about this rule, make your voice heard by visiting takeactionTN.com and submitting a comment to the EPA about your thoughts.